Transport and the need for transport has become an important part of daily life in South Africa. Not only does the movement of goods and services play an important part in the South African economy, but the types of transport available to individuals affects spatial decisions in terms of work, entertainment, education and place of residence. Stats SA publishes a range of transport-related information in various reports and publications. 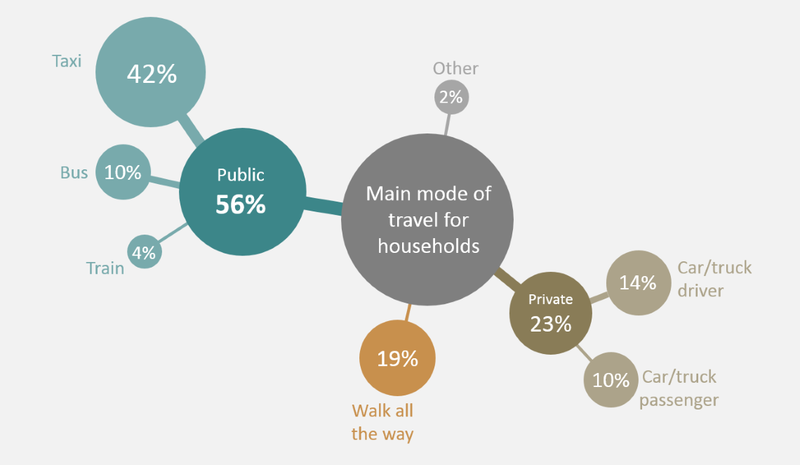 The National Household Travel survey (NHTS) provides insight into the travel patterns of South African households, providing information on modes of transport used, such as land, air and water transport, as well as cycling, walking, public and private transport. Also included are statistics on travel times, transport challenges experienced by households, and travel patterns related to work, education and leisure. NHTS surveys were conducted in 2003 and 2013. Stats SA’s quarterly Gross domestic product (GDP) release provides information on the size and growth of various industries in the South African economy, including the transport industry. The same publication also includes figures on overall household expenditure on transport. The monthly Motor trade sales release provides the time series data of trade in motor vehicles and motor accessories. The Land transport survey, published on a monthly basis, provides data on passenger and freight transportation by land. The Producer Price Index (PPI) release provides information on the prices of transport equipment leaving the factory gate. The extent to which prices of fuel, public transport and private transport are changing is covered in the monthly Consumer Price Index (CPI) release. Stats SA’s Quarterly Labour Force Survey (QLFS) and Quarterly Employment Survey (QES) provide information on the number of individuals employed in various industries, including the transport industry. The Quarterly Financial Statistics (QFS) and Annual Financial Statistics (AFS) reports provide a financial overview of various industries, including transport, storage and communication. Data on turnover, income and expenditure, profit or loss and various balance sheet items are also included in the reports. The transport and storage industry report for 2013 provides more in-depth information on the size, nature and structure of the transport and storage industry. This periodic survey provides details on employment within the industry, trading income, expenditure, profit or loss, inventories, sales and services, and purchases.